Summary: North Atlanta High School and the Mt. Paran Community NEEDs SIDEWALKS! Northside Parkway is extremely dangerous for students and pedestrians. 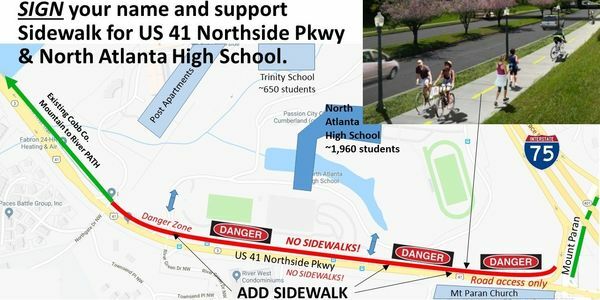 There is NO walking access to or from North Atlanta High School (NAHS 1,960 students + ~650 Trinity School Students). There is STRONG COMMUNITY support to build a sidewalk along Northside/41 from Mt. Paran Rd to the Cobb County border/trail system from NAHS, Trinity School, MPNA, PATH, GDOT, West Buckhead residents. Plus this connects Buckhead to Cobb County's extensive trail networks including the Chattahoochee River parks, Silver Comet Trails and even Suntrust Park. Notes: Supporters of this effort include Councilmember J.P. Matzigkeit District 8, Atlanta City Council, and Principal Douglass NAHS. Project is a PATH sidewalk (bigger than normal sidewalks) and on the school side of N'side Pkwy. Atl. Mayor Bottoms will hold a Town Hall meeting this Thur, Feb. 28th, at the Atlanta History Center (130 W. Paces Ferry Rd, NW). Doors open at 5:30 & meeting starts at 6:30. If even a fraction of petition signers YOU (~400) are able to show up & join us, there would be a majority in the meeting that cannot be ignored. Thanks for your help & support. Project ID: 0013056.